This book, for which I illustrated the cover, has just been released by Editions Dominique et compagnie. When the editor asked me to make this Book Cover Image, she had a very clear idea of what she wanted : something very graphic, colourful, that told the story. Sohane, the heroin of “So Nice”, an urban 15 years old girl, was forced to move to the Toques islands. Which made her a Toquée. How awful ! At first she absolutely wants to convince her parents to move back to town. – She finds the book written by her grandpa when he was her age. – To keep away Leila’s pest that keeps circling around the beautiful Derek. – To sing in the group made by her new friends. 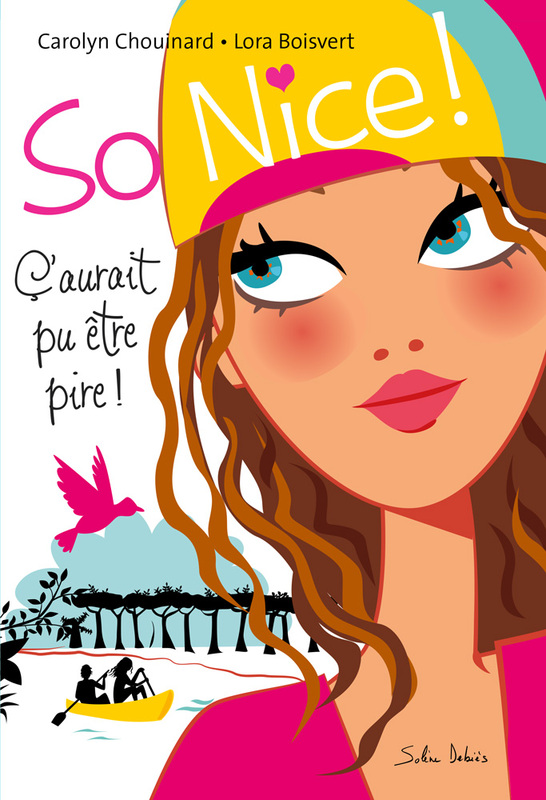 “So nice”, this “youth” book is designed for very young girls (12 -14 years) ; more for children and young teens. It’s the first opus of a modern and dynamic series, funny, touching, with intrigue and love stories ! It could have been worse ! To draw this children’s illustration, I had a brief : to represent 15 years old girl : Sohane, who has big blue eyes with orange specks, brown frizzy hair and discuss the place : an island on the edge of the water. The cover leaves us thinking that she will meet a -Beautiful ?- young man. Finally, Sohane’s not going to be that bored on her island, it could have been worse !